"The September 11th attack came on Bush's watch, despite doing nothing after being warned (August PDB and several Richard Clark missives) that a major attack might be imminent. After a successful invasion of Afghanistan, he took his eye, and our financial and military resources, off bin Laden and al Qaeda, and instead squandered these resources in the colossal, wasteful distraction known as Iraq. Let's remember the first World Trade Center attack occured in 1993, eight years before the 2001 horror...which was only six years ago. Let's not forget how methodically al Qaeda plans its attacks. Let's not be lulled into any false senses of security here. Our ports are still unsecured, as are our Southern and Northern borders. And, unlike Ramsay Yousef and company--perpetrators of the 1993 attack--bin Laden, Ayman Al Zawahiri and other 911 masterminds still roam free while al Qaeda and the Taliban is reconstituting in Afghanistan. And over the weekend we learn of an arrest in a plot to blow up JFK airport in New York. No, sir, we are anything but safe today...and President Bush, and the former Republican-controlled Congress, is directly to blame." When are we going to have a Democratic candidate who not only has the balls to speak up and speak aggressively on this issue, but is one who is not saddled with the burden of having supported Bush's mess up until campaign time? Well, his name is Al Gore, and I suspect after watching the debate Sunday he'll be even more motivated to enter the race. THE DEMOCRAT'S CULTURE OF CORRUPTION IS ALIVE AND KICKING!! - Just think, Nancy Pelosi wanted to put William Jefferson in charge of the Intelligence Committee AFTER knowing he accepts bribes. Democrats, who are usually so quick to call for someone's resignation, are mysteriously quiet. A federal grand jury on Monday indicted Louisiana Democratic Rep. William Jefferson on 16 charges relating to a long-running investigation into bribery, racketeering, obstruction of justice and money laundering. Calling it a "broad range of serious crimes," federal prosecutors called the case one about "greed, power and arrogance." "The 16-count indictment alleges a pervasive pattern of self dealings, bribery and corruption by Mr. Jefferson, in violation of his oath of office, of his duty to the United States Congress in which he served, and of the duty to the citizens of the United States," said Chuck Rosenberg, the U.S. Attorney for the Eastern District of Virginia. The officials said the investigation spanned from the United States to Africa and alleged it involved a number of occasions of criminal conduct by Jefferson, including bribing businessmen in a congressional building and promising a businessman that he would bribe a Nigerian official. The chief prosecutor of the Justice Department's criminal division, Alice Fisher, said the case shows that the department is strongly pursuing corruption. "Today's charges demonstrate that the Department of Justice will continue to enforce the public corruption laws that are designed to ensure the integrity of our government. The department will continue to hold accountable those public officials who will use their office and commit illegal acts such as the bribery schemes outlined in today's indictment," Fisher said. The inch-thick, 94-page indictment was handed up in U.S. District Court in Alexandria, Va. If convicted on all charges, Jefferson could face a maximum prison term of 235 years. I agree that Jefferson should have stepped down long ago. All his continued presence has done is give the rightwing bloggers fodder for their attacks on Democrats. As to wishing for a Democratic candidate who would speak out against the war, Mr. Gravel and Mr. Kucinich have been doing just that all along ~ and have been ignored all along. Sadly, people don't seem to want a candidate who speaks truth; they want a candidate they think can get elected. The mission of the Ostroy report is not about putting the best person for America into the White House, it's about winning elections and obtaining power. "Our mission is to help Democrats regain the White House and Congress." Our mission doesn't include the words "truth" or "justice" by design. 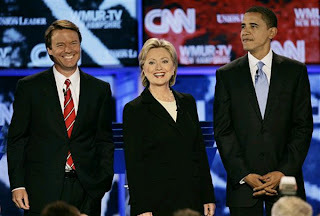 Andy-----you could have titled it "Hillary flat out LIES at Dems debate"----here's the LIE: watch and enjoy her LIES. Wow, the screwballs are out in the comments for this one. You're right, Andy. Obama blew it. Repeatedly bombing at debates and other such forums goes to show what many of us have said all along: OBAMA IS NOT READY. I will add this further prediction, namely, that Obama's premature effort on the national stage will doom any future aspirations to national office. So long loser. Can't anyone who responds to this blog respond to the topic written by Ostroy??? If not, get your own blog and call attention to what you want to be the subject of a discussion. Obama did blow it and the other Dems were not very impressive either. Edwards is my chocie so far but he seems scattered or even troubled. Hillary was "sound and fury signifying nothing." What did she really tell us? Whereas I thought the Republicans presented themselves as more forceful, passionate and better versed in their campaign points. I am a Democrat and I am worried about the choices we have at this time. I truly hope Gore runs. Hillary LIED and said ALL the Republicans support Bush, support the surge and are for the war-----LIE!!!! Ron Paul is against the war (always has been), does not support Bush and does not support the surge. If Hillary is a liar, then so is Bill. They are bought and paid for establishment distractors from truth. Gore will continue the war too. This is why the Democrats demonize Ron paul too, because they are secretly FOR the war, even though they SAY they arent. They are liars and Joe Biden is a traitor for voting to fund it. Bill Clinton is a liar just like his successor Bush----all Bohemian Grove members who discuss world policy while worshipping Molech. Andy, I thought you were smarter than this. Andy, your insightful analysis of Sen. Obama's performance, especially what he should have said, is absolutely correct! He should have been much more forceful and much more direct in his answer, laying all the blame on the current administration, who so richly deserve it. Obama has strong support across the country. Why are some of the above eating their own, so to speak? Obama would make a great VP candidate! Concentrate on the Repubs, not the Dems. Let's play their game for a change: Win at all costs!